Born at the turn of the century in Darlaston, Thomas (Tom) Butler was an inside-left who started his career in the Bormingham leagues. He was spotted by Walsall and made his first-team debut in 1921. He went on to score twelve goals in twenty eight games during his one and only season with the Saddlers. Despite that decent record he returned to non-league football but Butler’s goalscoring prowess had come to the attention of eminent Port Vale manager Joe Schofield (who was also to lose his life while working for the club) and Butler was handed a trial. 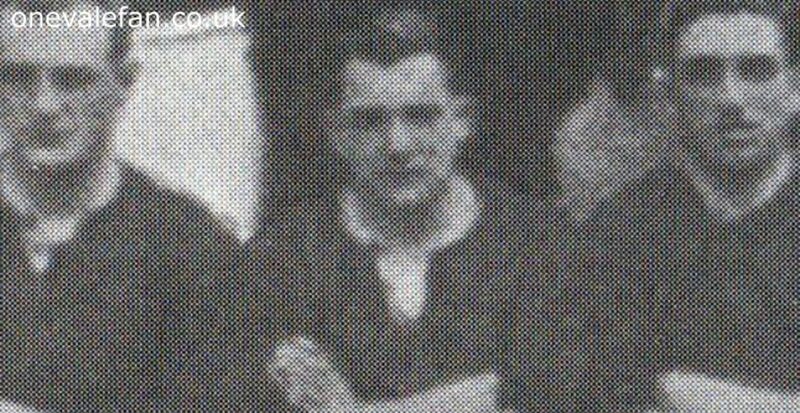 Tom impressed and after a month at the club he was signed permanently in 1922 for a fee of £100. Butler was a huge success in his first season with the club ending it as top-scorer with nine goals in 26 games. In the summer, Butler scored against neighbours Stoke and he further endeared himself to Vale fans by scoring against the Potters at the start of the 1923-24 season. However, a tragic event was to occur on the 3rd November. 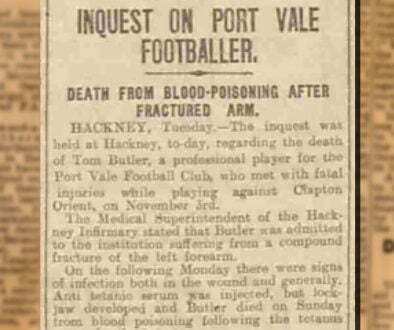 Butler scored Vale’s goal in a 1-1 draw with Clapton Orient but towards the end of the match he suffered a compound broken arm. Butler was treated at Hackney hospital but complications set in giving the unfortunate Butler septic poisoning (or tetanus). He sadly died eight days later in hospital. The club paid his widow the rest of his wages, and Stoke City as well as numerous other clubs donated generously to provide his widow with a £700 benefit fund. Sadly, we will never know if Tom would have built on his promising start for the club and this plus the tragic circumstances of his untimely death make his a worthy entrant into our cult hall of fame.